Traveling cross country with two cats can be a wicked experience. I don’t know if you have ever traveled cross county with cats in your car. My advice to you is don’t take car trips with cats if you don’t like cats. Their cattiness will be on full display for the entire trip. It is much easier (and more expensive to drug your cat temporarily then fly them across America.) There are ways to survive a car trip with a cat with your sanity intact. We recently relocated to Florida from Texas by way of Georgia. We planned three multi-day stays and a few one day stay trips with our boys stuffed into the back seat of the car in their carrier. We were a bit afraid of having the cats in the car for hours at a time. We have two cats. Dark is a three-year-old neutered male Sepia Ragdoll. We got him because he did not look the way Sepia Ragdoll kittens look when born. He was dark, almost black. The breeder was disappointed. Of course, as soon as we brought him at twelve weeks old, he started to lighten up and now looks and feels like a very expensive mink coat. Dark is a very sweet gentle boy. Dark is a “Black Belt” in stealth and concealment (sneaking around and hiding). Tall came to the family as a companion for Dark. Tall is a two-and-a-half-year-old neutered black male Munchkin with normal legs. Tall has the Munchkin curiosity, energy and mischievous attitude with the ability to execute. We wanted to drive as we had friends and relative stops along the way. Some of our peeps are cat people; many are not. Sometimes we stayed in hotels, sometimes in people’s houses, and worst of all, sometimes in people’s houses with a cat litter box in the room with the boys (cats) and us. 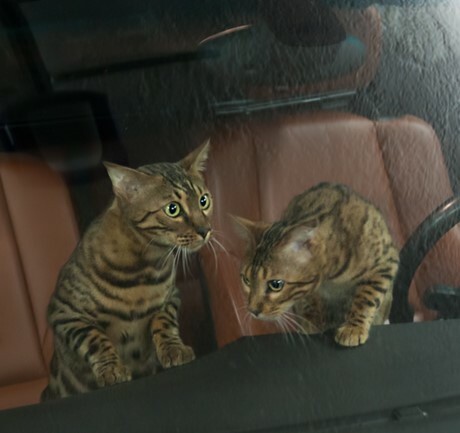 The most fun, however, was the cats’ behavior in the car while riding merrily along. Tall cried the first two hours of every trip. It didn’t matter if Tall was in the car carrier or out of the carrier. He cried while sitting in my lap, on the floor, in the back window. It was nerve-racking. If the day’s trip was long, over six hours, we would stop, set up the litter box, feed the cats and let them do their business. Water was always available during the trip in a bowl under my feet, passenger side, front seat. The first secret is that the cats preferred hotel rooms to friend’s and family’s homes. They quickly learned to look out the large hotel windows. They would sit in the sun. Both cats were comfortable with their food and litter box being in the hotel bathrooms. Staying with friends involved meeting new people. The cats did not like meeting new people, especially children. They did not like the smells in the homes, but the hotel room smells did not seem to bother them. In hotel rooms, they could freely walk around and explore, not so much in people’s homes. We learned to seek and book hotel rooms set up in the same orientation as our bedroom. The pets would prowl around the hotel room for a bit then settle in their usual spots on our bed. Our pack and unpack process were direct opposites. Checking into the hotel, we brought the cats in first; unpacking their litter box, litter, food, toys, treats, and medicine. We arranged their food and water bowls. We let them out of the carrier as soon as we organized their items. Checking out of the hotel, we brought the cats out last. We packed up their items and put the cats in the carrier after everything else was loaded. Dark hid so well during one stop that I was afraid that he had gotten out of the hotel room. My husband and I spent over a frustrated hour looking for him before we found him, stuffed into a small shadowed space behind the solid headboard. I was so relieved that I stopped being angry and aggravated. I love those crazy cats. At a minimum, traveling with our two “boys” made us plan the trips in detail which was good for everyone. All in all, humans and animals made it with minimal wear and tear. The cats have settled back into their daily routines as have we. We have one more move before we are done. I’m looking forward to being back on the road with my two boys.